Dale Gilbert Jarvis: The ghosts of "Chicago: The Musical"
Appropriately enough for a musical about murder, revenge, and adultery, there is a ghost story loosely associated with the show. The original Broadway production opened in 1975, running for several years. The show went through a couple incarnations, before being revived on Broadway in 1996, and a year later in the West End, London. The 1997 London revival of “Chicago” took place at the the Adelphi Theatre. The theatre was rumoured to be haunted by the shade of the noted actor-manager William Terriss, owner of the Adelphi Theatre, and great friend of Henry Irving. Terris was murdered at the stage door in 1897 by a fellow actor and jealous rival, Richard Prince, who stabbed him three times with a dagger. Terris lived long enough to perish in the arms of his mistress, actress Jessie Milward. “I’ll be back” were said to have been his final words. True to his word, Terriss returned to haunt the backstage areas of the Adelphi Theatre. His ghost was first reported in 1928, when a stranger to the theatre saw a male figure in the laneway, a figure later identified as Terris from a photograph. Later, poltergeist activity was reported in the dressing room once used by Milward. There are a few interesting bits of folklore surrounding the murder. One story relates that on the day previous to the killing, the actor’s understudy woke from a disturbing dream in which he had seen Terriss lying on the steps to the dressing room with a bloody, gaping chest wound. Another tale states that the murderer, Prince, was declared insane and spent the remainder of his life in the Broadmoor Criminal Lunatic Asylum, where he spent his remaining days producing plays featuring himself as the leading character, with the other inmates in supporting roles. 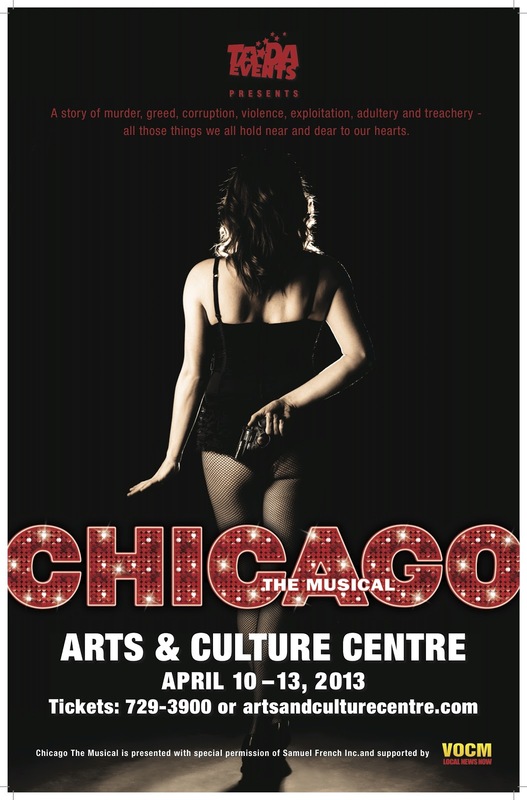 I don’t know of any murdered actors hanging around the Arts and Culture Centre, waiting to spook the cast and crew of the St. John’s production of “Chicago.” However, the Centre may have a ghost with a fondness for musical numbers. A few years ago, I got an email from a woman by the name of Jaimie, who had been working in the basement of the building. At the time, Jaimie had been working in the archives on a project which involved a lot of trips back and forth through the collection. One day she heard the noises again, on a day when the theatre was empty and the children's library had closed. Jaimie turned her head, expecting to find a lost library patron; “as we occasionally do,” she explained. Instead of another person, she found herself looking at nothing but an empty aisle and a pale grey concrete wall. The site of the current Arts and Culture Centre was formerly the site of the Shannon Munn Memorial Orphanage. In 1918, Sir Edgar Rennie Bowering and Mrs Mary Munn presented the property, to be known as the Shannon Munn Memorial, to the Church of England Orphanage. Is the basement of the St. John's Arts and Culture Centre home to the ghost of a singing nun? If you’ve had a strange experience in the building, let me know. In the meantime, I’ll be busy polishing my lines, and keeping my eyes open for ghosts, and for jealous rivals.